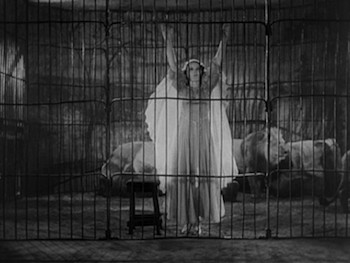 The 1931 drama The Miracle Woman is the kind of movie that few folks besides Frank Capra could pull off. It's a film that manages to simultaneously be a sincere portrayal of faith while maintaining a healthy sceptical cynicism in regards to human nature. While other directors might find a hard time striking a balance between these two themes, their own personal interests or agenda causing them to lean heavily one way or the other, Capra deftly works between them without ever seeming like he's pushing a message. Barbara Stanwyck stars in The Miracle Woman as Florence Fallon, the daughter of a preacher who is being run out of his church by the congregation he devoted his life to because they prefer a younger, flashier style of clergy. When the old man dies the day he is meant to give his final sermon, Florence delivers a blistering lecture instead. Bob Hornsby (Sam Hardy, King Kong), a con man passing through town, happens to catch the performance. Impressed by Florence's guts and her knowledge of the Bible, he takes advantage of her lost belief to convince her to join him in running a fake revival scam. Florence soon becomes a popular traveling preacher who reaches a huge audience by broadcasting moral lessons on the radio. One person who hears her message is an aviator who was blinded while serving his country. John (David Manners, Dracula) is about to throw himself out the window and commit suicide when Florence's voice calls him back from the ledge. He goes to one of her revival meetings, a circus-like spectacle that even includes live lions on stage, and ends up meeting Florence by volunteering to join her in the lion's den. A friendship develops, and then romance, as John's natural goodness reminds Florence that she once believed in providence, too. The only thing standing between them being together is Bob, who isn't keen on seeing his meal ticket run off and get married. It's one thing for Florence to make others believe in her message, but a whole other thing if she starts believing it herself. The script for The Miracle Woman is by Jo Swerling (The Pride of the Yankees, Lifeboat), working from a play by John Meehan and Robert Riskin. It's nicely paced, cutting time between the exaggerated world of Florence's operation, including swinging backstage parties run by Bob, and the isolated quiet of John's apartment. The relationship between John and Florence progresses naturally, with the blind man offering her a respite from her troubles. Stanwyck does quite a job here, managing to keep the bluster of her performances and her diva-like attitude off-stage from overshadowing the more honest emotions of Florence's true character. The big finish that brings down Florence's invented church plays just as well as the angry sermon she delivers at the start in the very real one, and though the film's closing scene is a bit sappy, Capra otherwise maintains the earnestness of the narrative without ever straining. The Miracle Woman both shows respect for true believers and pity for how their beliefs can sometimes be taken advantage of. Hardy's onscreen villain may be a bully and a brute, but the real evil in Capra's tale is how people seeking answers and solace often end up juked by the very system they've gone to for help. The Miracle Worker comes back to DVD as part of the Sony Choice Collection manufacture-on-demand program. 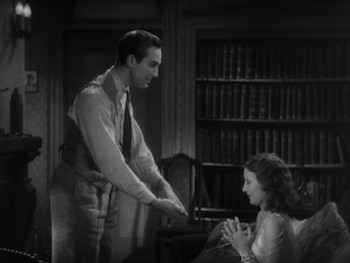 The black-and-white, full-frame transfer tends to be soft at times, with blurred edges and the occasional scratch or mark, but is clear overall and good enough for an older movie of this kind. The mono soundtrack is decent, lacking in hiss or distortion. Recommended. 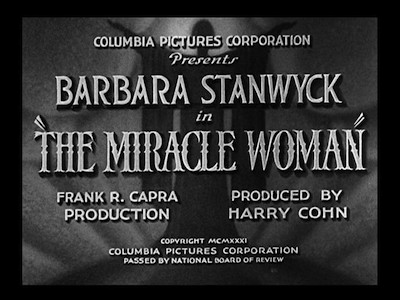 Frank Capra's 1931 vehicle for Barbara Stanwyck, The Miracle Woman, is an affecting drama about faith--both its loss and its return, and also how religion can be twisted. 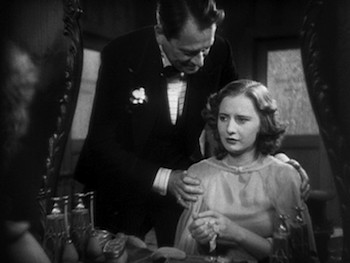 Stanwyck is excellent as the revivalist huckster, and her love affair with a blind man manages to be sweet and poignant. Good stuff.